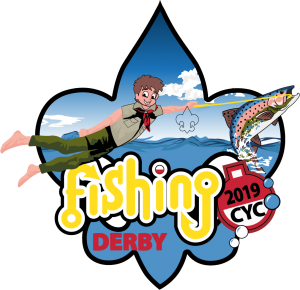 Scouts fish from 8 am – 1 pm. Adults fish from 11 am – 1 pm. The $18 registration for the morning of fishing with a two trout limit includes pancake breakfast and event patch. If you would like to attend and enjoy breakfast but will not be fishing, the cost is $5. See below for Fly Fishing merit badge opportunity! This event is held rain or shine (or snow!) – Sorry, No refunds. Check in opens at 6:30 a.m. at the Dining Hall. There are two lines for check in. If you are eligible for the Express check in line, you will be receiving an additional confirmation email in March, listing your individual registration. Please print out the page with the registration information and hand it in at the check in desk when you pick up your packet. The packet will contain your breakfast tickets and the patches that must be worn by anyone who is fishing. The packets are designated by the name of the individual who submitted the registration. If your pack or troop registered as a unit under one person, you will need to know where to meet with that individual, as he/she will have all the patches and tickets for your unit. If you are the coordinator for a unit, please make sure that all your participants know how to find you. Class size limited to 16 Scouts!